Not the most glamourous of jobs but someone's got to do it! If you need a septic tank emptying it's inevitably urgent and not something you can cross your legs too long for. Servicing tanks all over the UK everyday, we're your solution for getting it sorted faster and cheaper than your current supplier. If you need a toilet and haven't got one on site we can supply that too, either small individual portable toilets or the larger toilet blocks. No mains drainage? 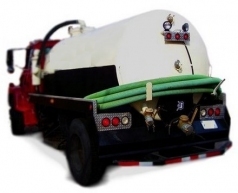 No problem - we can supply a portable septic tank too. Everything you need to keep things flowing smoothly!! !